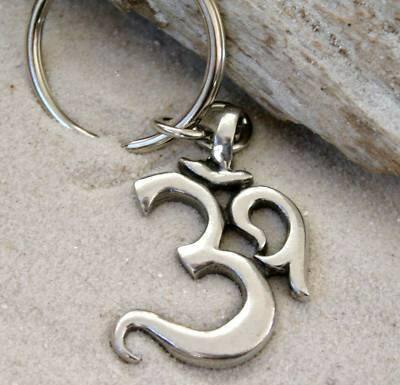 This lovely Ohm Keychain is handcast and hand-finished in solid American Pewter with a shiny finish resembling antiqued sterling silver. The Key Ring is the classic split ring and measures 1 1/4 inch or 32mm. Aum or Om is the most important Hindu symbol. This symbol is actually a sacred syllable representing the Brahman or the Absolute ~ the source of all existence. Brahman, in itself, is incomprehensible so a symbol becomes mandatory to help us realize the Unknowable. It is made up of three Sanskrit letters, aa, au and ma which, when combined, make the sound Aum or Om and is also called pranava, to mean that it pervades life and runs through our prana or breath.